In the past decade, Beijing and Moscow have been more competitors than partners. But that relationship may now be changing as Russian and Chinese leaders are considering combining their two countries’ regional economic projects — the Eurasian Economic Union and Silk Road Economic Belt, respectively. the post-Soviet economic bloc that includes Armenia, Belarus, Kazakhstan, Kyrgyzstan, and Russia. The two projects would be combined under the auspices of the Shanghai Cooperation Organization, and if the proposal is completed, it would make the opaque organization the preeminent economic body from Shanghai to St. Petersburg. The proposal would combine the regulation of the Moscow-led bloc with the deep pockets of China, which has already invested more than $50 billion in Central Asia. Piggybacking on the Eurasian Union’s joint customs space could drastically reduce costs for shipping products from China to Europe, with goods only having to cross one unified tariff zone before entering the European Union. Chinese state news agency Xinhua called it a blueprint for “cooperation and prosperity of the whole Eurasian continent.” That marks quite a departure from Moscow and Beijing’s previous tug of war over influence in Central Asia. As Putin has found himself isolated from the West and his economy weakened by sanctions and falling oil prices, the Kremlin has aimed to bolster its relationship with Beijing. Russia’s pivot east has come mostly in the form of energy deals, exemplified by a gas deal last year worth more than $400 billion. 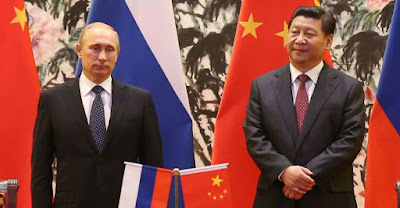 Moscow also joined the Beijing-led Asian Infrastructure Investment Bank this year, and is in talks at the Ufa summit to start a new development bank under the SCO, a proposition that Moscow had previously nixed for fear of giving China too much power in its sphere of influence. Russia is aiming to retain its influence as the security guarantor in the region, keeping its sway in the region through military bases in Central Asia, arms deals, and the Collective Security Treaty Organization, a security bloc of former Soviet countries. This formula satisfies both China, which is wary of deploying troops beyond its borders, and Central Asian countries used to a Russian military presence. Under this arrangement, China would be the bank and Russia would be the big gun. Despite the roadmap being drawn in Ufa, the agreement still faces major obstacles before coming into effect. According to experts, the Russian leadership is divided on anchoring itself so firmly to China. On one side, pragmatic technocrats within the Russian government view cooperation with China as an economic necessity given Moscow’s falling out with the West, its inability to match Beijing’s deep pockets, and the fact that Russia needs Chinese investment. But the Russian security organs remain wary of how an unimpeded China could erode Russian influence. At least for the moment, the pragmatic camp seems to winning the argument.